Inpatient rehabilitation provides around-the-clock clinical and psychological support, allowing a person suffering from addiction to focus on recovery by removing the distractions of day-to-day life. Here is a look at the types of inpatient rehabilitation available and alternative approaches to treatment. Has the client consumed the substance excessively, over an extended amount of time? Has the person previously relapsed from previous treatment? Are there multiple substances being abused? Does the person have a poorly managed chronic illness? Does the person have an onset of an illness that appears to be life threatening? Are there any co-occurring psychological illnesses? Does the individual experience physical withdrawal symptoms subsequent to the cessation of use of substances? Inpatient rehabilitation programs typically have a duration of about 28 to 30 days. Residential rehabilitation facilities tend to provide longer programs, usually up to 6 months at a time, but do not offer the medical care typically provided at inpatient facilities. These facilities usually provide aftercare once a more intensive rehabilitation program is complete. Because residential rehabilitation focuses on continued recovery and providing skill sets for post-treatment life, these centers are known to have more of a comfortable “home-like” feel to them, and provide a client with the setting that feels most like being out of treatment. Ideally, a client follows up a medical detox with inpatient rehabilitation for up to a month. The intensive programs and resources would provide them with the skills needed to get through the upcoming, long-term aspects of recovery. Following inpatient rehab, the client could opt for a residential program to continue to have support as he or she transitions back to the responsibilities and stressors they faced before they sought treatment. At Sprout, we believe strongly in the importance of aftercare, which we have found to be an important part of allowing individuals to feel confident and ready to manage everyday life in sobriety. Inpatient rehab provides the structure, support and medical assistance that clients need during the crucial early phases of recovery. Days are structured in a way that provides little downtime, keeping a client’s mind off drugs, and continuous professional support is available in the moments that clients need it most. Many highly addictive drugs also have intense physical withdrawal symptoms that require the careful supervision of a medical professional to safely manage. Inpatient centers provide a controlled environment with access to resources needed to reduce dependence on harmful illicit substances, including replacement drugs. Staying in a facility among other people with the same goal of sobriety is yet another benefit to inpatient treatment. Developing close relationships with other like-minded individuals creates a natural sense of accountability and support. Lastly, multiple kinds of therapy serve the client well when diving into their addictions and modifying their responses to triggers. The skills a client can develop from therapy provide a sense of resolve when that individual faces stressors and temptations after they’ve transitioned on their own. Preparing to enter into inpatient rehab can be overwhelming. Life outside of the treatment center will be put on hold, so in the weeks leading up to treatment, coordinate with friends and family to manage bills, pets and other responsibilities. Since your rehab facility may only allow you to bring certain items, ask for a recommended packing list beforehand. The Family and Medical Leave Act provides up to 12 weeks of medical leave, so if you are concerned about maintaining your employment statues, you need not worry about informing your employer. Transitioning into normal life can have a massive impact on your success in recovery. 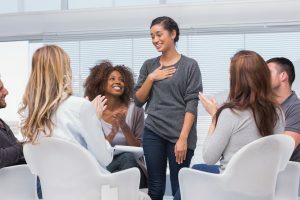 While in treatment, you will learn what underlying beliefs and triggers you have that encourage your drug abuse, and how to handle those outside of therapy. However, the internal work doesn’t end there. When you return home, there may be negative influences in your life that need to be removed for your continued sobriety. Old friends who have not sought recovery, stressful jobs that add to your anxiety, and changing scenery to keep your spirits up are all things to consider when returning home and staying on the path to recovery. Having a good grasp on the likelihood of relapse is also important. In the event of relapse, using that experience to learn more about yourself and the influences in your environment that you can improve to make your resolve even stronger is key to success. Finally, in life after rehab, you may want to continue therapy. Getting additional support when your environment has shifted yet again could make a world of difference in your transition outside of treatment.